Administrator Scott Pruitt is carrying out Trump campaign promises. In its first year under President Donald Trump, the Environmental Protection Agency moved quickly to fulfill several promises Trump made during his presidential campaign, most notably to roll back climate regulations put into place under the Obama administration. As part of an effort to carry out executive orders repealing regulations and re-examining landmark environmental policies, the EPA also began a process to repeal the Clean Power Plan, which would impose restrictions on greenhouse gas emissions from power plants, and to start a review of the Waters of the United States Rule, intended to limit pollution in bodies of water. Along with rolling back policies intended to combat global warming, Administrator Scott Pruitt removed references to climate change from the EPA's strategic plan and supported the president's decision to withdraw the United States from the Paris climate agreement. It has been an honor to serve @POTUS & the American people in 2017. Here’s to even more accomplishments in the new year! - Rolled back burdensome & duplicative regulations ?? - Prioritized Superfund cleanup ?? - Exited Paris Accord ?? But while the agency claims success in the quantity of regulations scaled back in its first year, its actions are far from final in most cases. Many EPA decisions face legal challenges from environmental and public health groups that want the rules to stay in place. (David J. Phillip/AP Photo, FILE) Workers are shown at San Jacinto River Waste Pits in Channelview, Texas, Sept. 13, 2017.. 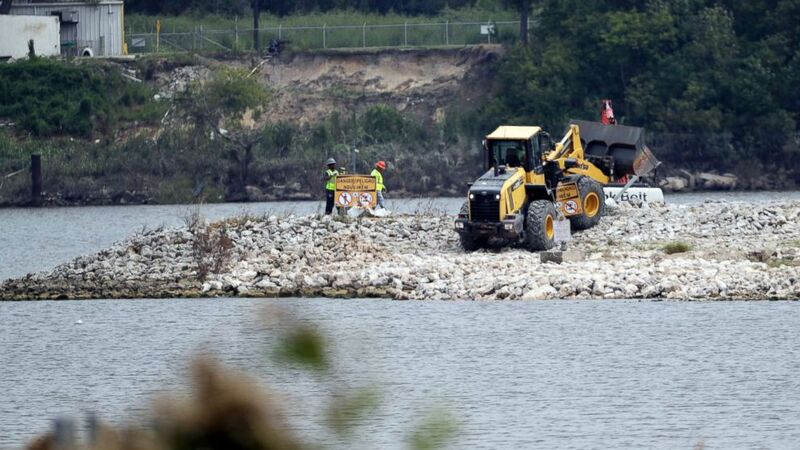 The EPA says an unknown amount of a dangerous chemicals may have washed downriver from this Superfund site during the flooding from Hurricane Harvey. In addition to its policy priorities, the agency spent much of Trump's first year responding to Hurricanes Harvey, Irma and Maria in conjunction with several other government agencies. EPA worked to secure contaminated Superfund sites in areas affected by the storms and tested floodwater and drinking water systems for dangerous bacteria or chemicals. Early in 2018 the agency still had more than 700 staff members involved in hurricane recovery in Puerto Rico and the U.S. Virgin Islands. Trump and Pruitt further sought to significantly shrink the EPA over the past year, proposing drastic budget cuts and offering buyouts that reduced staffing. From December 2016 to January 2018, the size of the agency has shrunk by 1,500 people, according to the Office of Personnel Management, and its current total of 14,162 employees is fewer than worked for it under President Ronald Reagan's administration. The agency additionally altered its policy on the scientific boards that advise the agency, blocking any researchers from participating if they received grant money from the EPA. This story is part of a weeklong series examining the first year of the Trump administration.